compatible with the Bugaboo Cameleon, Bee, and Donkey seats when using corresponding adapters (sold separately). Reversible seat: faces outward so little ones can see the world and inward so little ones can face Mom or Dad while jogging. Reclinable seat: allows little ones to sit up straight when awake or recline when relaxed. Large wheels: 16” rear wheels and 14” fixed front wheel for a smooth, straight run with utmost stability. Air-filled tires to provide a smooth run. Tracking controls on front wheel; to adjust any deviation if needed built-in suspension to absorb shocks. Mud guards on all wheels to keep you clean. Easy access speed control brake: make it easy to operate at any time, with any hand. Height-adjustable handlebar; to suit your height and running posture. spacious and easily accessible underseat basket; so your essentials will stay in place during a run. 3-year warranty: To receive the additional year of warranty, customers must register their product online at bugaboo.com within 3 months of their purchase and provide a valid proof of purchase showing a purchase date of April 1st 2014 or later. 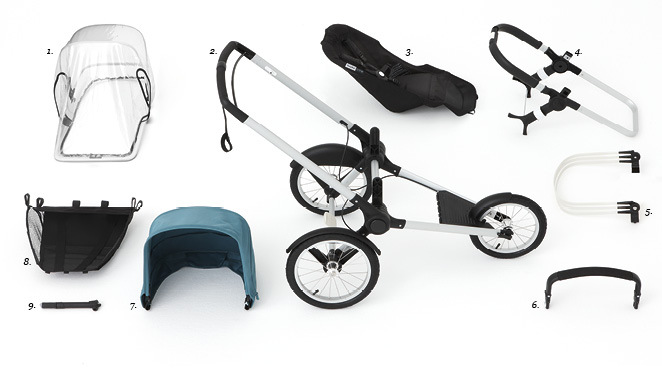 Please note: Never use the Runner Stroller Base with a carrycot, bassinet, pram, or infant car seat. Frame: Clean with a damp soft cloth. Do not use abrasives. Bugaboo offers a complimentary extra year warranty on all strollers, the Bugaboo Donkey Duo extension set, Bugaboo Bee³ pram body and the Bugaboo Runner seat. To activate this extra year of warranty, simply register your Bugaboo products online within 3 months of purchase.